As I was sitting here thinking about what I wanted to post today, the thought came to mind that I haven't represented the great city of Memphis enough recently! 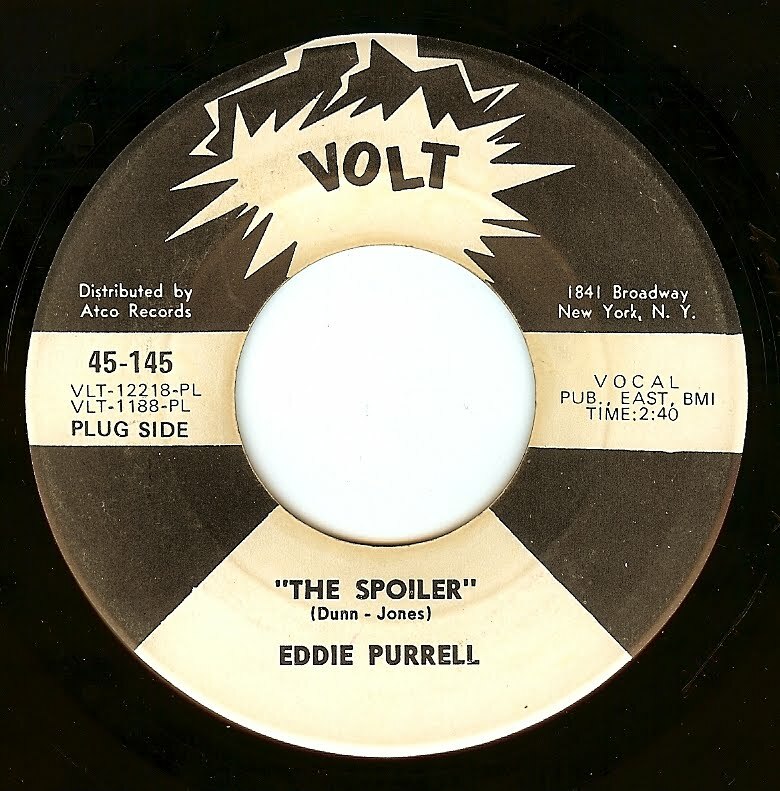 Written by Booker T Jones and Duck Dunn for Detroit native Eddie Purrell, this record drips with Memphis mojo. Those Memphis cats (I'm gonna assume it's MG Al Jackson on drums) had a way to keep the energy up but have a relaxed feel that has never been duplicated by anyone, anywhere. As for singer Eddie, I believe he only released two 45's. He certainly deserved better, as his voice is excellent and full of attitude. 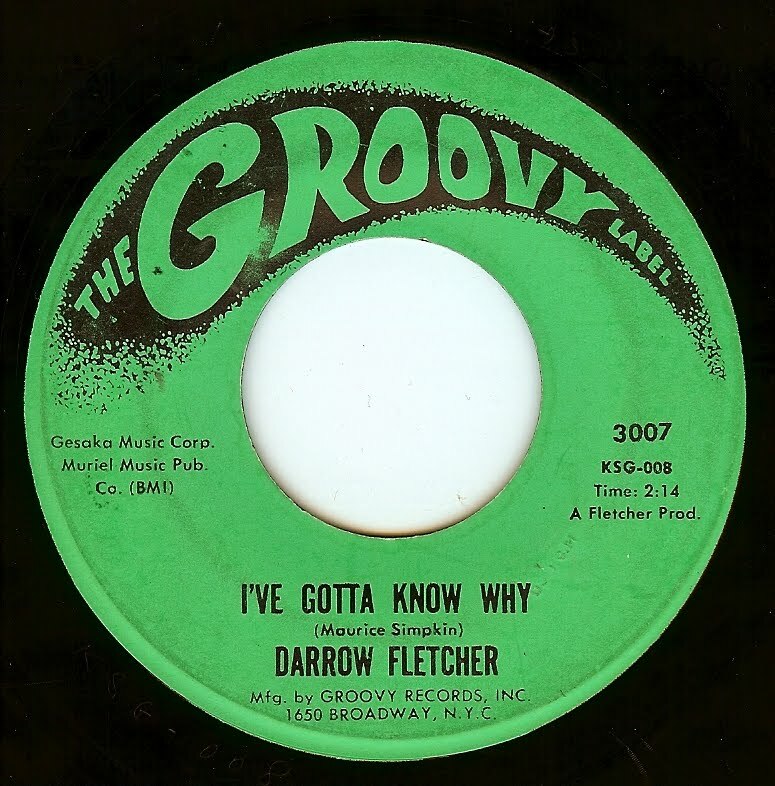 Simply another incredible song from child prodigy Darrow Fletcher. Darrow has a near perfect discography with practically no dud releases. Who is this, the Impressions? One would definitely be forgiven for mistaking this majestic track as being an Impressions cut. No surprise, as it was not only written by Curtis Mayfield but Billy Butler is also the younger brother of Jerry Butler. Curtis is certainly singing backups as well. This record is yet another page in a chapter in the big book of Chicago soul; I simply don't think it's possible for anyone with a heart to listen to a record like this and not enjoy it. Curtis had a way with his writing to take a subject with a dark or heavy message and make it swing as heard here. 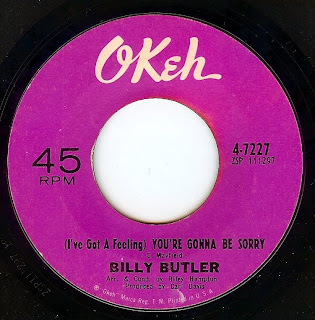 Billy was only 20 years old when this record was cut, and he had been recording for two years by this point. 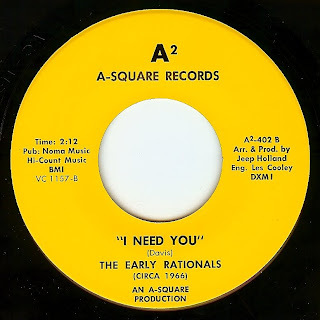 Here's an absolutely gorgeous ballad from this Philadelphia group. Vocals are smooth as silk, and the production is full of those big Philly production hallmarks- strings, vibes, horns, and the kitchen sink. 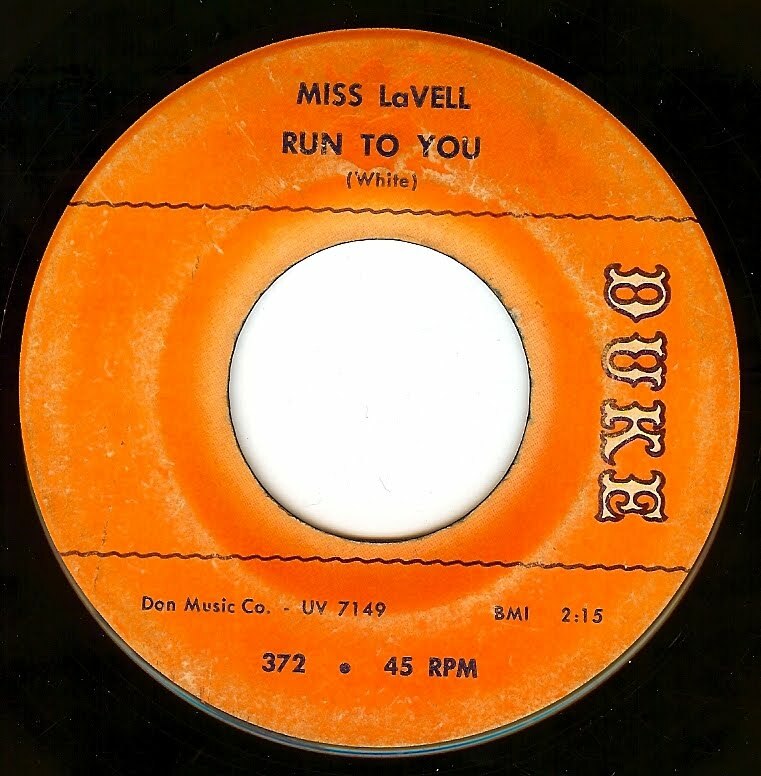 While her greatest success was in writing "Lead Me On" (a massive r&b hit for Bobby Bland), Houston, TX native Miss LaVell (aka LaVelle White) also cut some great records on her own. LaVell performed regularly in the Texas/ Louisiana regions and still continues performing to this day. This is a record that I never thought I would actually own; both because it's insanely rare (and on the want list of practically every garage/ psych collector) and because I simply don't dig as deep into garage 45 collecting as I do soul and British invasion. However, this record has been kicking me square in the pants since I first heard it on Pebbles Volume 5 back in the summer of 1992. I had just gotten the first 7 volumes of Pebbles, taped them all and used to drive around blasting them in my 1980 Mustang. Talk about teenage freedom! This record inspires people to do outrageous things to acquire it; in my case, I saw it come up on ebay and felt that it was "the time". I put a nice old vintage Gibson amp on craigslist to secure the funds, it sold quickly and I was READY. 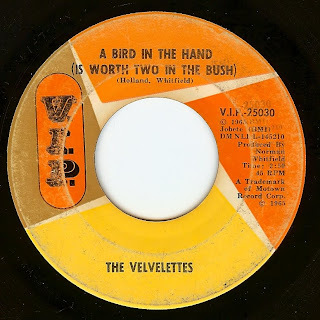 There's another legendary story about a couple of friends of mine that, over breakfast one morning, made a trade- a copy of this record for a 1963 Vespa! Granted, the Vespa needed lots of work but STILL; that's a trade of epic proportions! Here we are four paragraphs in and I haven't said much about the record. 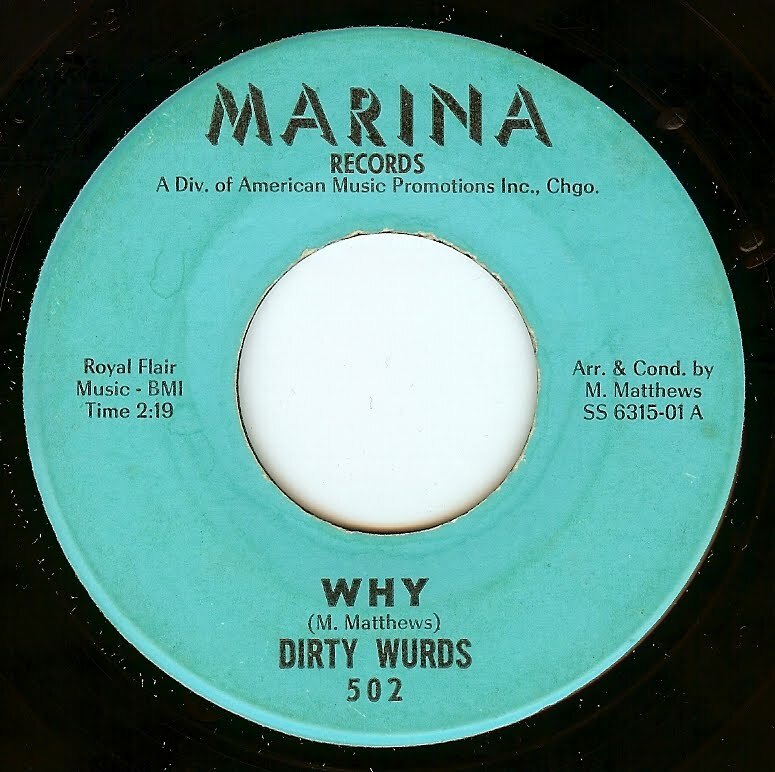 The Dirty Wurds were a teenage band from Chicago (age 16-17) who cut their teeth together playing bluegrass (!) then went in the beat direction. According to the liner notes from Pebbles, they would regularly open for national acts and practically cause riots! Not surprising, as this song is probably the earliest, nastiest nascent punk record. The b-side is a pretty good bluesy workout too (with an excellent guitar break). While this song wasn't written by Van McCoy, his indelible stamp is present, as he not only arranged but co-produced this record which is yet another brilliant side from his discography. A New Jersey group, The Spellbinders discography is tiny, but every release is a gem! Yet another group that simply deserved more acclaim. 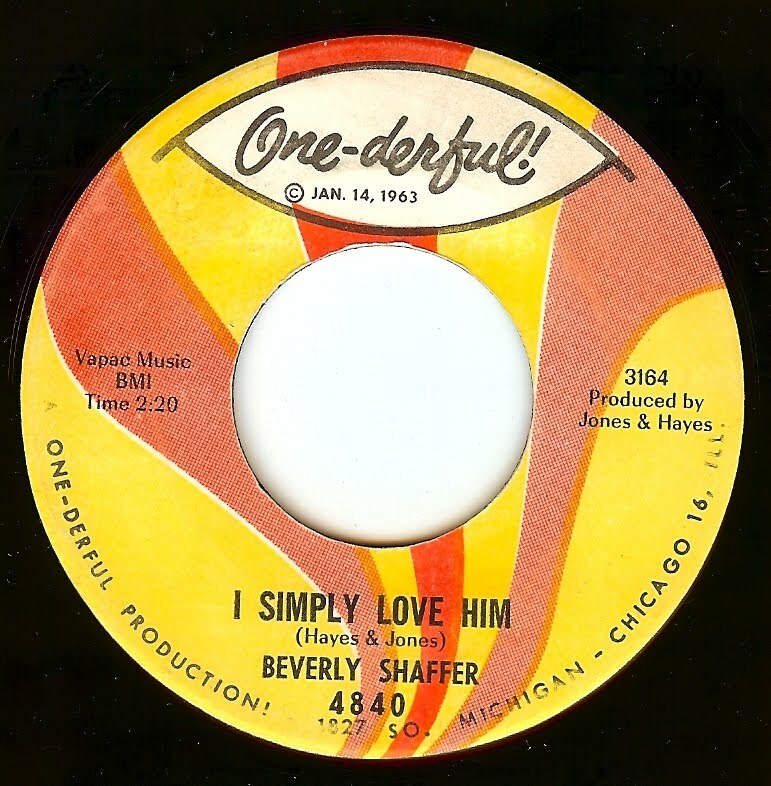 The talent pool in sixties Chicago was so deep that a singer such as Beverly Shaffer, with a dreamy, heavenly voice, only got two shots to record (both in 1966). This song is simply gorgeous, with one of those melodies that hums around in my head all day. Sometimes it's best to just sit back and let the record do the talking. This is one of those cases. I seem to really dig hearing funky instrumentals on Mondays; something about them seems to ease getting back into the work week. 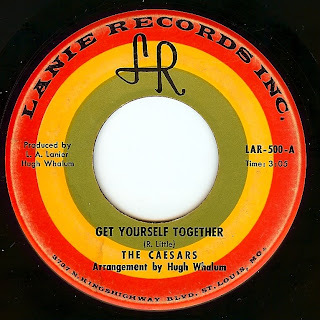 Not a lot is known about this Los Angeles group (although they did release one more rare, in-demand 45 called "Funk-I-Tus"); I get bowled over by the interplay between drummer and organist on this cut- sheer dynamite! 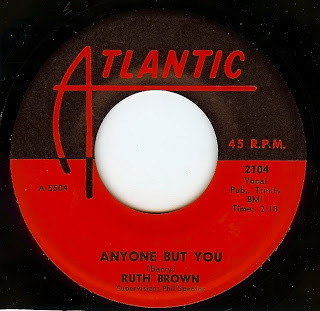 Incredibly popular throughout the 50's, by 1961 Ruth Brown was a fading star. Trends were changing, and her sound became the sound of a bygone era when culture was changing at an incredibly rapid rate. On this record, we hear the sublime voice of Ruth matched with hot, young producer Phil Spector for what is, in my opinion, her finest record. The chilling "Anyone But You" is delivered by the voice of someone who has known absolute heartbreak and has lived to tell (read more about Ruth here, on the always excellent Spectropop website, while b-side It Tears Me To Pieces is a cool, slow burner that once again shows this woman was one of the finest singers of any era. If you're gonna hate something, it might as well be something as nasty and ugly as hate itself, right? 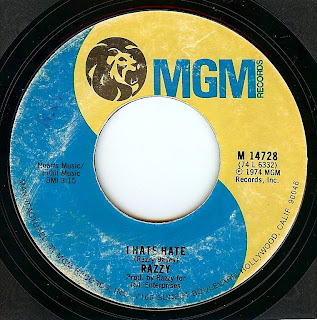 This is an incredible record that was recorded in 1972 by Razzy (Bailey), known mostly as a country singer who crossed over into the r&b world quite successfully. 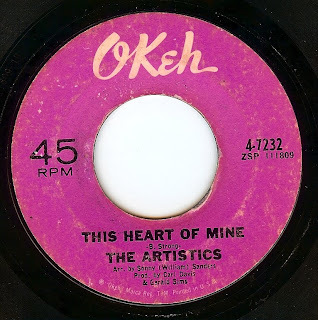 This was released by a small label initially and was picked up almost two years later by MGM and issued again, as it had been one of those songs that never hit huge but was bubbling and bubbling and seemed destined to break in a big way. And sadly, 35 years later the message is still as strong as it was then. Trivia: the original release on Aquarian records is stereo, and this pressing is in (45 fanatic approved) glorious mono. This record certainly deserves to be featured, as it is pure Motown girl group bliss. I was hoping I'd wake up this morning and find out that he didn't really die; RIP, Alex Chilton 1951-2010. This is one of his earliest songwriting forays, written and recorded when he was all of 18 years old. 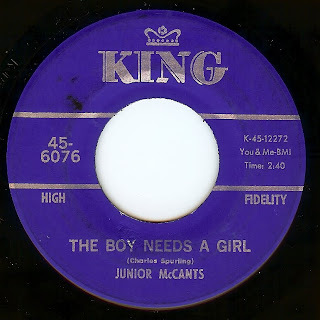 Here's Junior's "other" record; one that actually exists in numbers that mere mortals can track down (compared to "Try Me For Your New Love" which only exists as a white label promo, most of which were destroyed when Junior met a tragic demise in a motorcycle accident on the cusp of its release; a copy sold last year for just shy of $16,000). This is a truly incredible double sider from this Cincinnati singer; sad not only for his tragic young demise but also the fact that this record went nowhere in the charts. Junior certainly deserved better. 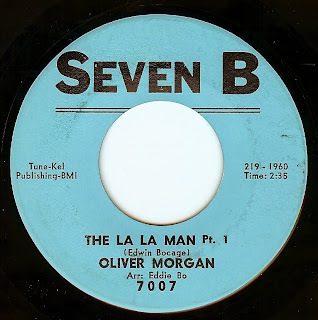 From the famed 9th ward of New orleans (home of Fats Domino, Smiley Lewis, Jessie Hill, and the Baptiste music family, Oliver Morgan was yet another fine singer and performer from this fertile ground. 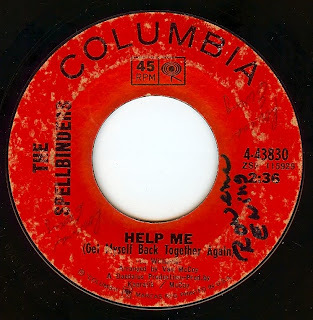 Here we find him paired up with daily 45 favorite Eddie Bo behind the boards for this steady groover. Oliver's first hit was "Who Shot The La La" written in response to the shooting death of NOLA singer Lawrence "Prince LaLa" Nelson; perhaps here he's stating that he's picked up the torch? I don't know, but it sho' does COOK and this is one of those records that causes me to daydream about those shrimp po'boys and the afternoon heat of that magic city. As usual, for all you folks who enjoy oart 2's, all you gotta do is write and I'll send it your way. From the pen of ace New York songwriters Lori Burton (who I recently read sang backing on John Lennon's "#9 Dream) and Pamela Sawyer, here's Detroit's Byrdie Green (mostly known as a jazz singer) OWNING the song with one of her r&b 45 releases. Lovely stuff! Sadly, Byrdie passed away in 2008 while part of the touring cast of Broadway show "Black & Blue". To all of those who write with negative comments, insults, "calling me out" on bootleg pressings, etc. You know, people that hide behind an "anonymous" moniker. 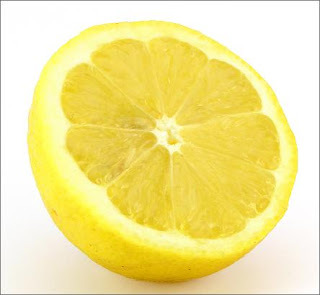 This site is not about "collecting" records per se. It's about CELEBRATING great music and education about the obscure (not only the reader but myself as well). Yeah, I've posted a few records that are reissues/ boots. Not often; 99% of my collection consists of original pressings. So what. If I were more intelligent I'd sell some of my originals, replace them with reissues and take the money and go on a nice vacation with my girlfriend. For the most part, I do not publish these comments because I find them irrelevant. This is the only post I will make of this nature as I like to stick to the positive! 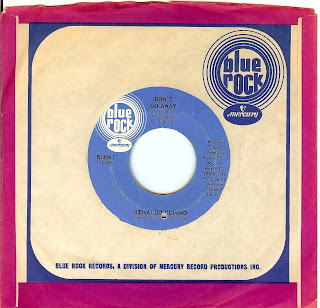 Years before the punk/ indie tradition of releasing a "split single" (2 bands on one record) this coupling finds two legendary Detroit bands paired together, covering some of the finest British beat (The Kinks and Pretty Things, respectively). A great record that I'm sure only gives an inkling of how incredible these guys were in concert during this time, although producer and Detroit/ Ann Arbor raconteur Jeep Holland managed to get some great sounds and performances out of these bands for his A2 label. I love how both sides take two songs that, in their original versions, were already highly ramped up and take them to another level of Detroit fuel. I'm not gonna say they are better than the originals, but they are mighty fine indeed. As I have spoken to (and interviewed) a number of musicians who were part of the Detroit scene during this era, they were strongly pushed by not only the British invasion, but also the incredible musicianship (and showmanship) of the Motown groups. 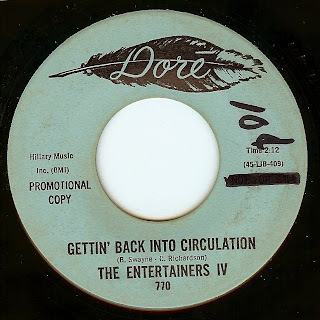 This record was released after an acrimonious split between the Scot Richard Case; note how the label bills them as "The old Exciting..."
There's a great history of the golden age of Detroit rock n roll here. If producer/ NOLA genius wasn't influenced by the work of that other NOLA genius Eddie Bo when he cut this record with Betty Harris, I would be very surprised. The backing from the Meters (featuring the mind bending drumming of Ziggy Modeliste) is some of the funkiest, most exciting music these guys ever cut (and that's really sayin' something, as the Meters were a force of nature on just about every recording in their catalog). Every piece on this track is unadulterated genius from the incredible horns (no one does it like Toussaint) to the snaky feedback guitar (Leo Noccentelli) that runs thru the track. 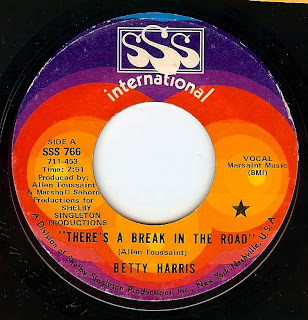 And how about Betty's vocals? Toussaint cut a string of 45's with her, and this was their final collaboration (and also her final release, period). Sometimes the cliche "saving the best for last" actually stands up. This record leaves me speechless! 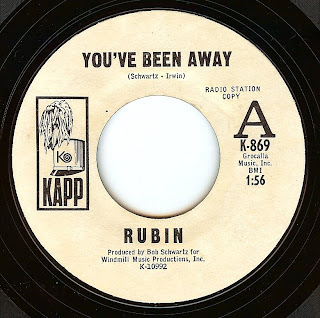 Anyone out there know who this Rubin fella is? Seems to be the only record made under this cryptic name. Internet searches of both Rubin and producer Bob Schwartz turn up fruitless. Sometimes, an all out funk burner is just what the doctor ordered. Today is that day. 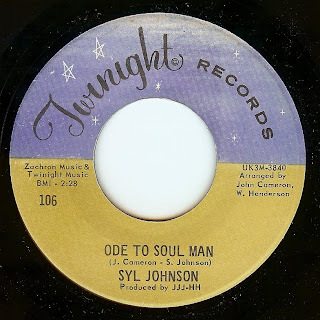 It has been far too long since I've featured the stellar work of Syl Johnson. I was very pleased to see that this monster is one that I have neglected to feature around these parts. If this doesn't put a great big grin on your face, I'm afraid you've come to the wrong blog! With a voice as sweet as sugar ("Domino" was his adopted name, after the brand of sugar), Renaldo Domino, with better exposure, could have (should have) been a massive star. Releasing a precious few seven 45 RPM records, this Chicago singer just never could get a break, commercially and dropped out of the business in the early 70's. The story has a happy ending, though. Thanks in part to soul fans worldwide and the efforts of the excellent Numero Group label and their exhaustive reissuing of obscure soul, Renaldo is singing in public again. This early effort is a catchy, well arranged song with incredible vocals (of course) that truly should have been a hit. An attempt was made twice; this same song was also released the previous year by Smash records as Renaldo's debut single. 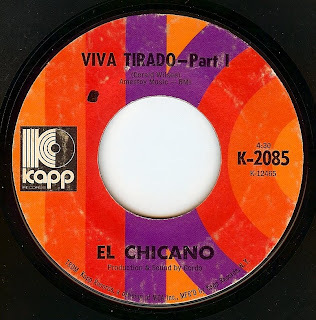 I know I'm a few days late in saying how sorry I am to hear that El Chicano organist Bobby Espinosa passed away last week, far too young at age 60. 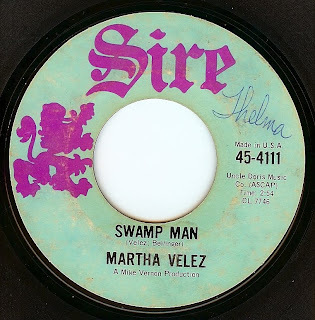 With a who's who of British rock n' blues musicians enlisted as backing musicians, New Yorker Martha Velez cut this record (which also ended up on her debut LP) in the UK with producer Mike Vernon. 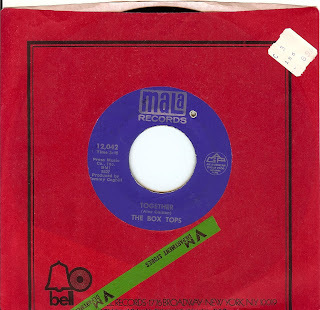 The other side seems to get more attention (it's a version of Etta James' "Tell Mama") but I am much more partial to this side, which is oozing with raw funkiness with Martha's brassy voice riding high over the top. Martha's career has also included not only a fair bit of acting, but also a stint in the mid-70's recording in Jamaica with Bob Marley. Born Barbara Crosby in St Louis, Barbara began performing at an early age (in her church choir and eventually as part of a family gospel group called the Crosby Sisters). She joined a secular group called The Petites in 1963 where she met local raconteur Oliver Sain. 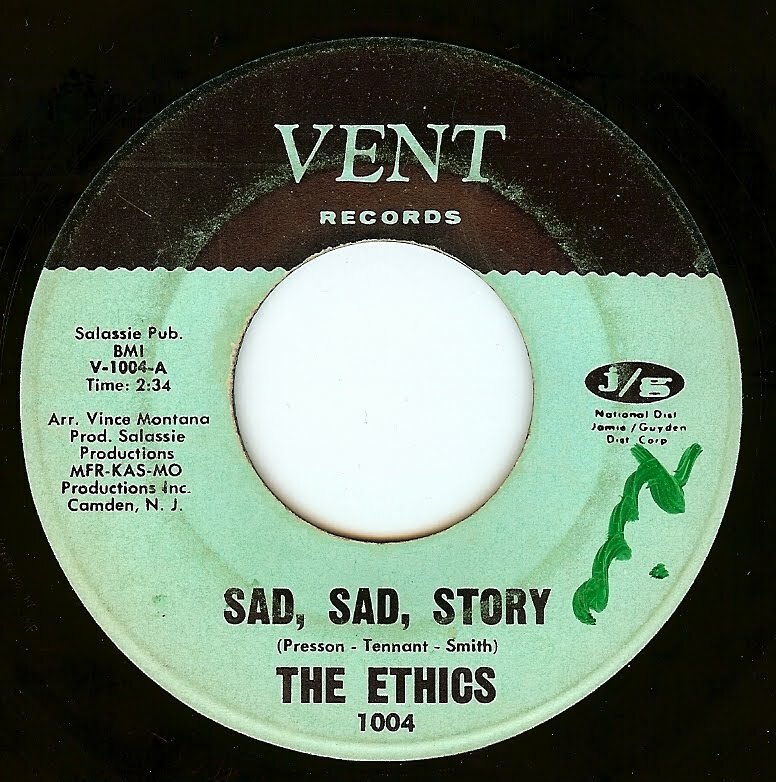 Sain was very active in arrangements and productions (many of which were released by Chess records), and had just broken personal ties with Fontella Bass. With her powerful, brassy voice, Barbara seemed to be the perfect replacement for Fontella. 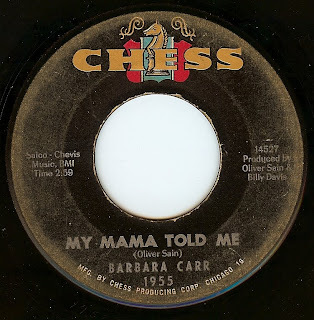 This was Barbara's debut single for Chess, and this is actually the b-side (however this side has gone on to be THE collectible side and the one which I first heard on the excellent compilation "Where The Girls Are Vol 3"). Sadly, Barbara's singles for Chess did not sell well, despite their excellence. 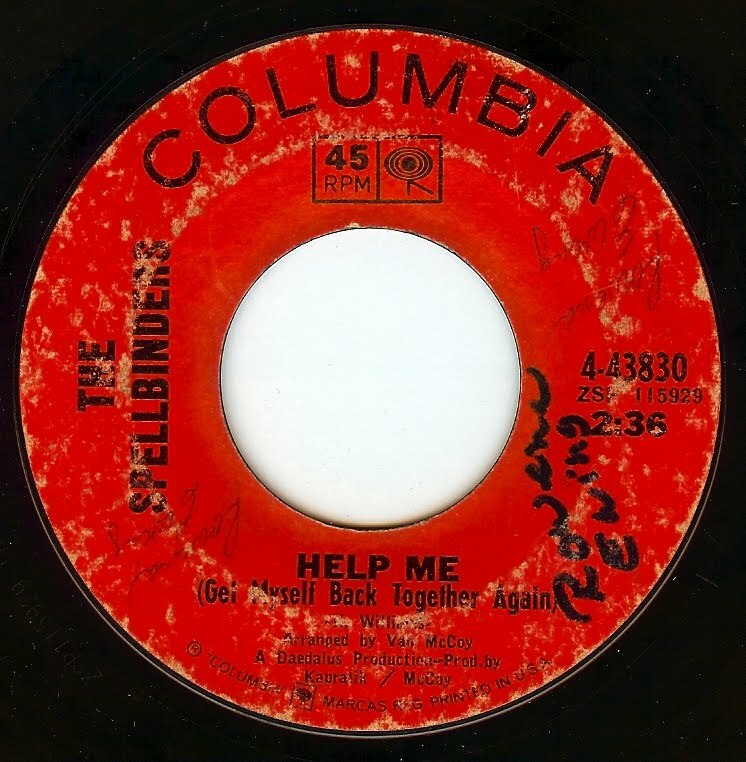 This 45 is notoriously difficult to find, and it took me quite a few years to snag a copy. All good things are worth the wait! 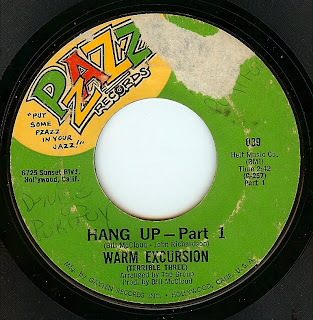 In addition to Barbara's amazing vocals, Oliver Sain's horn arrangement on this track is to die for, along with a relentless, hypnotic groove. After a sabbatical of many years, Barbara came back in the late 80's as a bawdy blues singer who is still very active today. 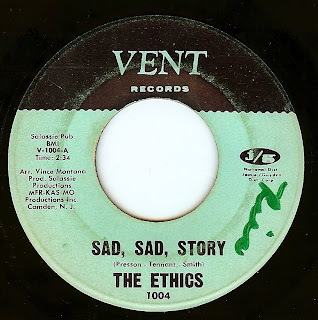 Here's a superb side from this L.A group (featuring Bobby Swain, formerly of doo-wop/ r&b group The Superbs) all about when we get up after a bad relationship, dust ourselves off and move on. As I sit and write this, I'm surprised to think about how few songs are about this topic! The performance and arrangement perfectly captures the frame of mind that this song puts across with stellar vocals. As we see from the label, some lucky so and so got this record for 10 cents at one time! I'm afraid to say it wasn't me, but when it comes down to it, records like this are priceless works of art. 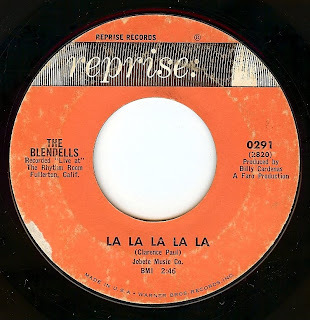 Coming out of East LA, the Blendells, along with the Premiers and Thee Midniters were at the apex of Chicano "Brown Eyed Soul"; all of these bands released scads of great records that were very influential on the west coast. Sadly, many of these excellent musicians were drafted into the Vietnam War, effectively ending their shots at continued stardom. This track, with absolutely infectious energy and groove, takes on Stevie Wonder's "Fingertips Part 2" and throws it in a blender along with some cilantro and southern California heat and turns it into an absolute party classic. I played this song out recently in a DJ set and about a half dozen people came up to me and asked what it was. Sometimes I lose track of what I have and haven't posted; I thought I posted this one ages ago, but turns out I didn't! Glad to have noticed that oversight, as this is one of the all time classics! 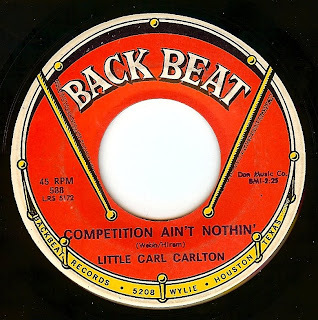 Carl was all of 14 years old when he cut this record. I've resisted posting this classic for a long time, as mu copy has some serious surface noise at the beginning but I woke up with it in my head and figured the time is right. You folks don't mind a bit of surface noise, DO YOU? Simply another incredible piece in the Chicago soul puzzle from the always excellent Artistics. 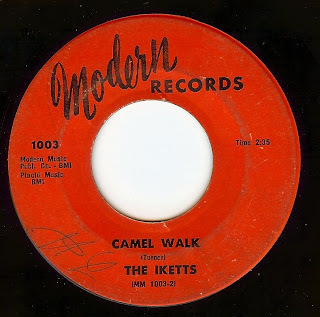 This track was written by Detroit's Barrett Strong (as in "Money (That's What I Want)") which I really dig; Chicago+Detroit+1965= perfection!